Bamboo for food? 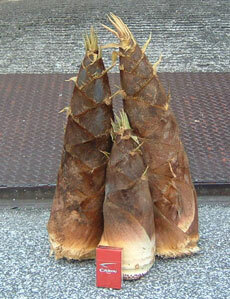 Yes, "bamboo shoot" (young shoot of the bamboo plant used in Asian cooking) for food is known to us. But you never heard that a hard old bamboo can be eaten as a healthy food. When I was a kid, I was raised by a foster mother and her house was surrounded by bamboo forest in the mountainside of Wakayama prefecture. 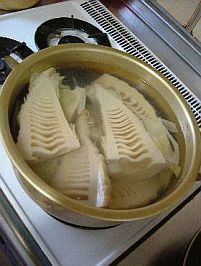 I enjoyed harvesting bamboo shoot every early in the morning, and I can remember that there were several kinds of recipe on the dinner table. 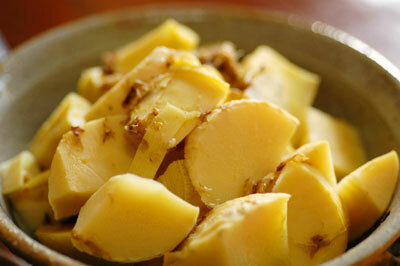 Probably, the above photos are some of how bamboo shoots were cooked in typical Japanese style. You can fry and mix it with meat and other vegetables or fishes, too. It was my dream to acquire a big land for planting bamboo. And finally, 40 years ago, I was able to purchase a big land with beautiful landscaped area where I planted nearly 100 bamboo trees. In three years, the area became full of bamboo bushes with another fruits bearing trees. Since then, we have enough bamboo shoots to make furniture, charcoals, teas, and other uncountable numbers of bamboo products. However, I never thought of old and hard bamboo as a healthy food. The idea to convert hard and old bamboo for delicious and healthy cuisine came to me when I met a scientist for modern food about five years ago. And here's how you can use that hard and old bamboo as an edible healthy food, and even for medicinal use. First, I would like to let you know how to make tasty and healthy bread with those 3 years old hard bamboo tree. 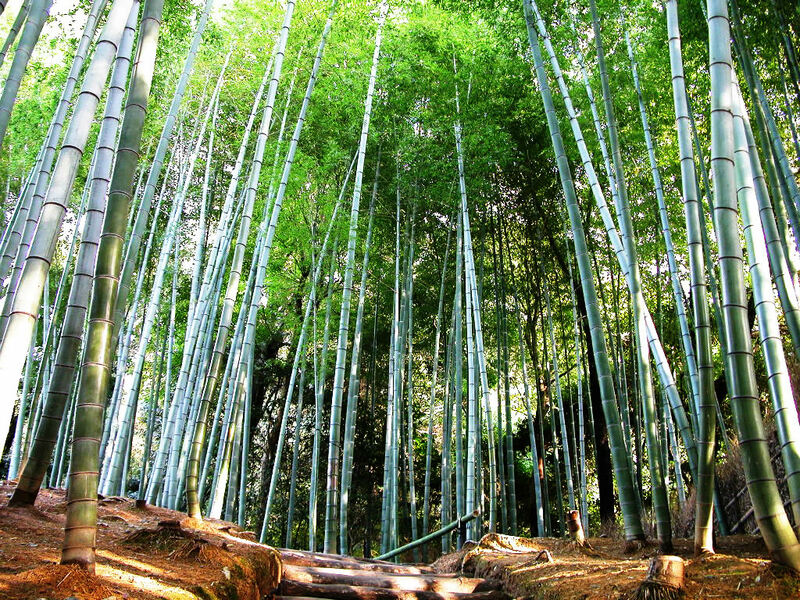 Yes, there are about 1,000 species of bamboo in the world from cold mountains to tropical regions. You can use any of its kind in your area. Make it in a powder or pellet or any form as you can see in the photos here. Once you powdered (grinded) the old bamboo tree, you can mix it with standard bread flour and bake it just the same way you did. 3-8 percent of bamboo powder is recommended. What is healthy with it? If you talk about nutritional value, there are about 20 kinds of minerals in it such as asparagines and glutamic acid. 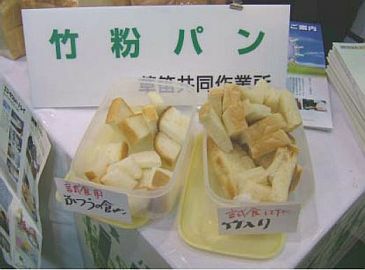 Whatever the nutritional value is, bamboo bread is with full of vegetable fibers, and it taste very good with a smell of bamboo itself. Bamboo foods reduce cholesterol in your blood, too, and feces will be with less bad odor (I do not say the smell is good <^O^>). 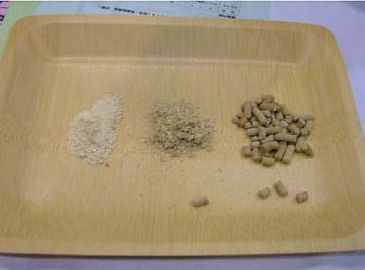 You can use bamboo powder for cookies, hot dogs, poultry feed, swine feed, other animal feeds, and many more. Just in this production alone, you can help your town with those abandoned bamboo to progress. You will notice that wastes of chickens and pigs which are fed with bamboo powders have less smell and their meat are more tender and tasty. Oh, yes, chicken eggs will also have clearer yellow yolk and stronger eggshell when bamboo powders are fed. You can let people of your town know about this project for the progress of your town. We are willing to assist HOW TO technology for them. Just write us if you have questions, and our staffs are willing to assist you. There are hundreds of bamboo uses, e.g. medicines, charcoals and edible charcoal, construction materials, foods, chemicals. There's a big money in bamboo tree and for sure if you get rich, you will feel healthy, too.